Making a ribeye roast is an easy dinner to prepare. You might be surprised at just how easy it is to make an amazing centerpiece. One thing you must know, it is easy to make a delicious tasting roast. Now, we are going to roast the ribeye in the oven. This is not a pot roast. There is no need to cook cut of beef in liquid, and you do not need to cook this in a slow cooker. Roasting is the ideal cooking method for a ribeye. Since we are not marinating this roast, we are going to season the outside. It is best to season the crust of the roast liberally, and then brown the roast, and place it into the oven. I like to season my roast simply with salt and pepper. Everyone has salt and pepper on hand, so chances are you have everything you need to prepare this roast. If desired, you could add a little crushed fresh rosemary, and I have even added crushed garlic before. If you want to learn how to buy a ribeye roast, you should consider grades of meat. There are many different grades of roast. In the grocery store, you will find three main grades of beef. You will find select, choice, and prime. Less than 5% of all beef is graded as prime; it has the most marbling. Choice has the second most marbling and then select. All grades of meat are tender and juicy. They can vary broadly in price, with the most expensive being prime, and select being the less costly. 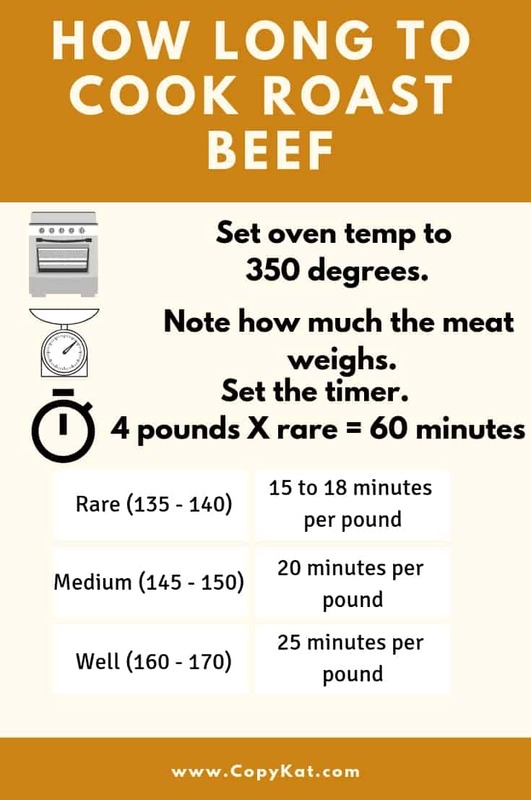 How long should you cook a ribeye roast? The answer is pretty easy. Look at the weight of the roast, this will help you determine the cooking time. Your next concern may be how long you should cook the roast? You shouldn’t worry about how long to cook a roast. There is a time guide on how long to cook a roast, and you should always invest in an inexpensive meat thermometer. I like to pull my roast out of the oven a degree or two before the roast reaches the exact temperature as listed below. The meat will rise a degree or two while it is resting. The meat should rest before carving. Just put a sheet of aluminum foil over the roast and wait for about 10 to 15 minutes before cutting. This way the juice will redistribute through the meat. You might wonder what you should serve with this roast. I would suggest some mashed potatoes, or some roasted Brussel sprouts, or even some Yorkshire Pudding. Be sure to check out my Top 100 Copycat Recipes! 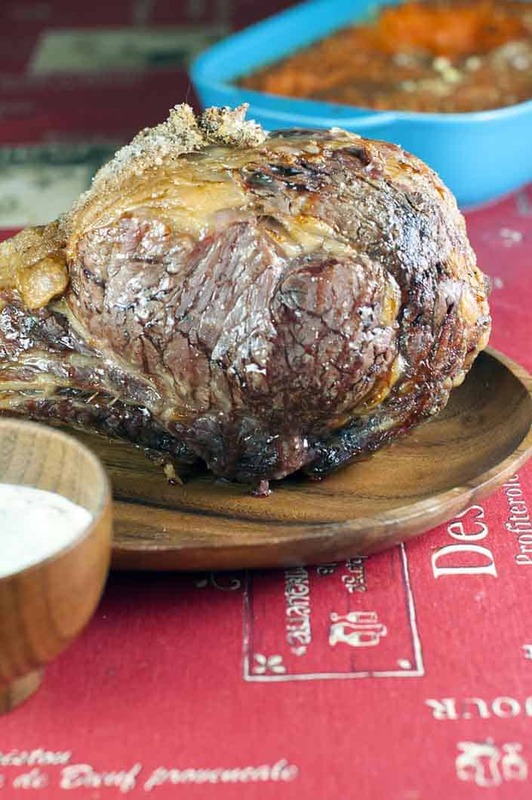 Learn how to cook a delicious ribeye roast. Preheat oven to 350 degrees. Drizzle a little vegetable oil over the roast. Coat roast liberally with salt and pepper. Heat a skillet to medium-high, and remaining oil to skillet. Brown the roast on all sides by sauteeing it for 2 to 3 minutes on each side.Place roast on a wire rack on top of a baking sheet. Bake approximately for 20 minutes for each pound of meat. Use a meat thermometer to check for doneness. After about 90 minutes, I used the meat thermometer to check the temperature. Be sure to refer to the chart and take into account the amount of meat. There is no set time for cooking any size of roast. The cooking time is dependent upon the size of meat that is used. I’m making a 6 1/2 pound ribeye roast for 8 people. The problem is one lady likes hers rare and another likes it more done. Any suggestions….besides not asking them over at the same time!! Give the people who like it more done the slices on the end, and give the people who like their meat more rare, give them the center cuts. We have the same problem in our family. So we cook it medium rare (it’s basically rare, no big difference except the edge of the roast). Then we slice it up. Those who want it more done will have their slices gently cooked on a pan for a couple minutes each side. All you are really doing is looking for color change. When I worked on a dinner train, we put those well done requests into the microwave for 30-45-60 seconds depending on thickness. Do we kee the thermometer in the meat the whole time or just put it in there meat after it has cooked a bit? You don’t need to keep in in the whole time, you can test it once it has cooked about 80% of the way. I need to make rib eye roast for about 29 people, don’t know for how long to cook it and I am going to need help figuring this out, I need an answer very soon. The dinner will be in 4 days. only have one oven. Can I bake 3 to 4 roast at a time? So can you bake 4 at a time, if they fit in your oven, yes, but I would use 4 meat thermometers? I don’t know you need 3 or 4 at a time. You would need about 15 pounds which should be one really large roast. If the Roast is 14 pounds, do you still cool for 30 min a pound? That would be 7 hours …. No, you allow the meat to rest before serving. The size of the roast is not important when allowing the meat to rest. Hi there. Could you please confirm me if the roast must be cover when is in the oven. Thanks ???? roast. Wha would be the cooking time per pound in a rotisserie? If we cook it in the oven and because it’s small what the best way of cooking in the oven? A rough estimate would be about 15 minutes a pound, so about 40 minutes in, I would use a meat thermometer to check the roasts temperature. wanted to know….I got a 4.79lb and a 5.13lb beef boneless ribeye roast. Is it ok that I roast them in the oven as if it was a whole 10lb piece? I don’t think I would try it like this. I would err on the size of each piece of meat. Can I partially cook roast day before and finish day of? I don’t think this would work well. May i cook it without resting on a wire rack and just lay it in a roasting pan with onion, carrott, and celery and a little water or beef broth? Sure you can do that, I think that would work. Should your roast be at room temp. before putting in oven? Or directly from the refrigerator? Yes, your roast should be room temperature, or close to it. You would have to leave it out for awhile for a whole piece of meat to get to room temperature though. Thank you Stephanie I like this recipe because it is very simple and the spices won’t over take the taste of the meat. I just used canola oil infused with garlic, salt and pepper. CAnt wait till it’s done. I’ll let you know how it turns out. I hope you enjoyed the roast. I am fairly obsessive about my rib roast. I am a big believer in searing the roast first. I get the oven to a toasty 450-500 degrees and let it sear for about 20 minutes and then drop the temperature to 325-350. Another thing that I do is roast a couple of heads of garlic and then make a paste out of it with a little red wine vinegar, coarse mustard and horseradish and leave it in the back of the fridge to age for tenderness for a day or 2. It really makes a huge difference! Forgot to say to spread the paste all over the roast and leave the roast(not the paste) in the back of the fridge for a day or two. IMO, the grade of beef is less important when you are dealing with the three most tender cuts, which are tenderloin, standing rib roast, and ribeye, since all of these cuts are well marbled with fat, and are inherently tender. I also think your internal temperatures are off. Most people think rare is 120 degrees, med. rare 125 degrees, and medium around 130-135, keeping in mind that the roast will continue cooking during the resting period. If you are going to cook beyond medium, you might want to get a less expensive cut of meat and braise it, cooking it for a longer time in a covered pan, since the higher cooking temperatures will dissolve the connective tissue that makes meat tough, and you can enjoy a tender and flavorful roast for a much lower price. I have had good luck cooking roasts like this for a longer time in a lower oven (e.g., 275 degrees), remove from oven at target temperature, rest for 15-20 mins., and then brown the exterior in a very hot oven after the roast rests. That will give you a roast with the meat cooked to the desired degree of doneness right out to the edge of the roast. I think you should salt the beef a couple of hours before putting it in the oven, then pepper and garlic before cooking. The salt will help keep the beef juicy. Pat the roast dry with paper towels before adding final salt, pepper and garlic rub. Use the broiler to brown the roast after it has finished resting. Put the rack as high in the oven as possible. Of meat.Watched your video followed it and came out perfect. Thanks. I am so glad this worked out well for you! This is the only way to roast meat.